How does the form guarding your precious gated content look to your visitors? Does your gated content whisper velvet rope entry for special guests or does it scream go away unless you’re willing to hand over your data? 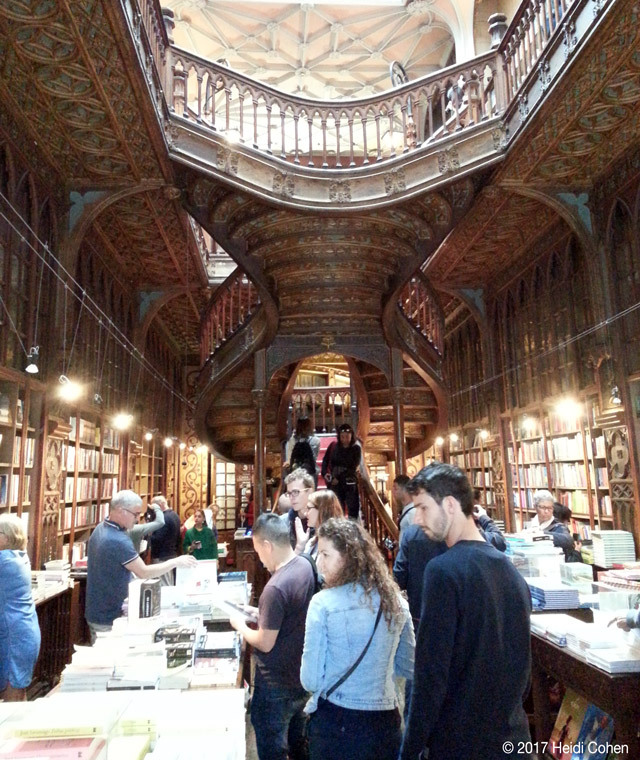 Tourists line up and pay to enter Livraria Lello in Porto, Portugal to soak up the wood carved interior that inspired J.K. Rowling. To feel the Harry Potter magic, they don’t think twice about the exchange. My Lello visit got me thinking about how marketers put gates in front of their content. We seek visitors’ information so we can convert them into qualified sales leads. But do we stop to consider how our visitors feel after the exchange? Lello’s visitors leave feeling happy and transformed. They’ve photos they treasure and share across social media. How do your visitors feel your gated content experience? This article will help you improve your gated content experience to reach your content marketing objectives. Gated content is high-value information visitors want and need that resides behind a form. To access the content, users must exchange their personal data by answering the form’s questions. It’s part of your overall content marketing strategy. While content often appears to be free, advertising from businesses interested in the audience supports it. Content, however, isn’t innately free. As a business you’ve invested resources to create and distribute it. So it seems logical from a business perspective that it should be part of a prospect transaction. Yet the problem is your target audience expects you to provide the content for free. How to get your content to break through, get seen, and yield sales qualified leads? Here are the 5 major types of gated and ungated content. Use them as a guide when making your decisions. But if you feel strongly about changing your approach for a specific type of content, test it. 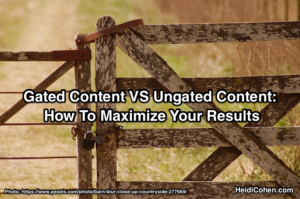 The tradeoffs between gated content and ungated content boil down to your marketing goals: Do you need traffic and reach or qualified sales leads? Yields more respondent information. Know your audience better. Increases content value perception. If you just give it away, it can’t be worthwhile. Improves sales conversions. Qualify prospects that are interested in your products. You can start with warm leads. Reduces audience size since people don’t want to share their information. Yields poor data. I’m surprised more marketers don’t assess this problem. Personally, I’m willing to exchange my information for quality content or with businesses I know. But generally, if I’m seeking information, I’ll do whatever is needed. Increases traffic and visibility while making your content sharable via social and email. Provides search benefits since it’s not behind a form. This also applies to links. Build trust with prospects. Removes roadblocks to visitor action. Looses potential data from prospects and referrals. Requires another way to encourage prospects to raise their hands. But your choice to gate isn’t all or nothing as Fishkin points out. 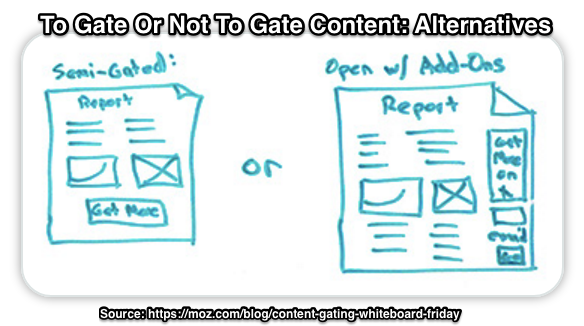 A less followed option is to semi-gate or add-on gating. This allows visitors to access part of your high value content while providing some information. 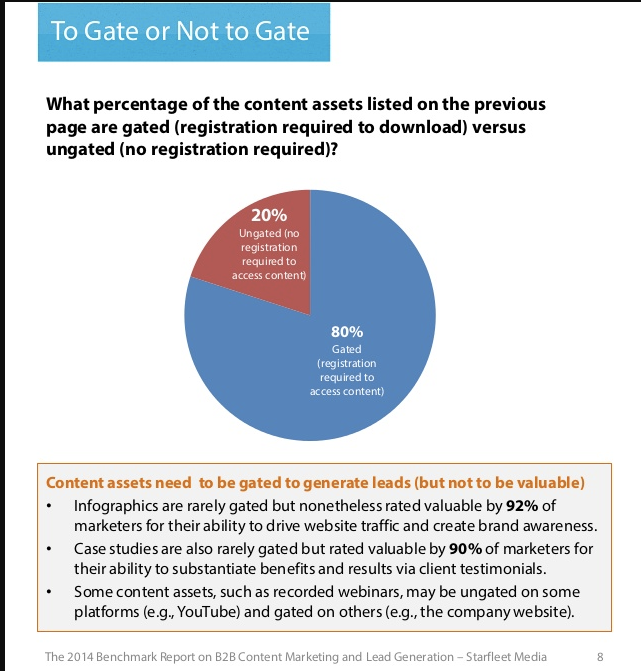 B2B marketers gate 80% of high-value content marketing assets behind lead generation forms (Starfleet Media’s 2014 B2B Content Marketing and Lead Generation Research). This proportion seems high to me since you need sufficient content to attract prospects and build trust. Drift ungated all of their content in April 2016. Specifically, they removed forms except for a lonely email subscribe button. By doing so, they drove greater leads. While this appears to make the case for ungated content, it understates the reality. Drift’s software provides an ever-present messaging functionality. Visitors see a friendly face ready to answer questions. This transforms every page into a lead generator. As a result, Drift’s approach is more akin to an add-on gating approach that answers customer questions on the spot without delayed sales follow up. Before gating content, assess whether your content should be gated. Most importantly ask: Have you earned the right to ask prospects for their personal information? 1. What is your gated content objective and is it related to your content mission and strategy? Marketing tradeoff for gated content: Traffic numbers versus qualified leads. Related to this challenge is the issue of numbers. Only a small proportion of visitors will complete forms. Without sufficient traffic you won’t hit your lead quota. Therefore assess at what point in their purchase decision do prospects need this information? Ideally, put gated content between the product consideration and decision phases. This way you can answer remaining questions and close the sale. 2. 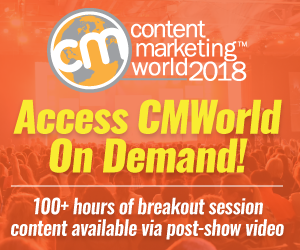 How available is your gated content? Is the information hard to find or organize (i.e. Is it worth an information exchange to your prospect?) This is a major reason to gate research. Determine if others give this information away for free. At a minimum, check competitors’ content offering. 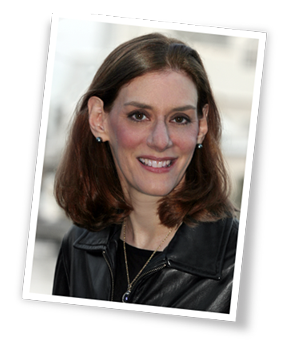 Does your audience perceive the information is high-value? This means formatting, presentation and ease of content consumption. 3. Have you earned the right to ask for visitors’ information? Do you have enough supporting ungated content to attract people who are so interested they’ll exchange their data? Use the hub and spoke approach to provide smaller chunks of related information building trust with prospects so they’ll trade their personal information. Amplify your ungated content distribution. 4. How will you use the information you collect? What action do I want my prospects to take next? Will our sales team be able and willing to use the information generated in a timely manner? How many potential customers will I loose because they won’t fill out the form? What is the minimum amount information you need to collect? Before you decide, know how you will use each element of data. Assess what information you currently collect from prospects and how you use it. Can you ask for visitor data in a tiered approach to minimize your upfront request? What is the quality of the information you receive? While many people will fill out forms honestly, know what proportion of data is usable. 5. How will you test the effectiveness of gating your content? Don’t assume your content should be gated. 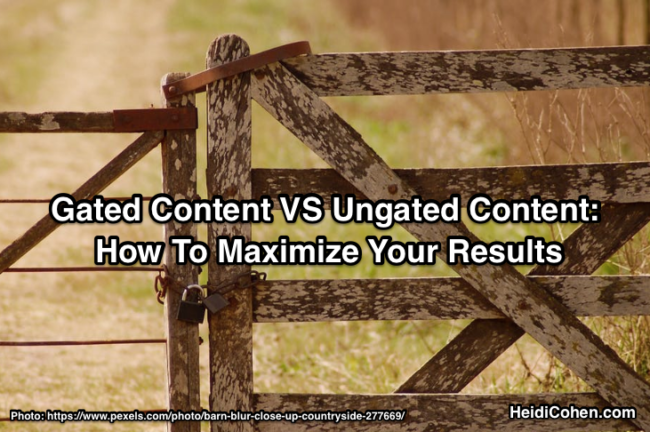 Test gating versus ungated content to prove it yields the results you expect. This isn’t seat of your pants marketing. Meet your audience’s specific needs. There’s no one path to purchase. Organize your information in terms of awareness, consideration and decision. Ideally gate content that helps prospects move from consideration to purchase. Develop supporting content to get visitors wanting more, deeper information. Warm your prospects by using useful information. Distribute ungated content broadly to attract interested readers. Continue to qualify prospects and keep them on track with your landing page. Highlight their painpoints, set expectations for your content and show benefits of the gated information to remove doubts and motivate them to act. Use a thank you page to communicate to prospects that their information has been collected and to direct them to the next steps. Set or reinforce expectations for your content. Outline next steps. Don’t assume readers will know what you want them to do next. If you don’t allow downloads directly from your thank you page, explain this. Keep your branding and voice consistent. Even if you allow prospects to download the information directly from your thank you page, send them another link to it. Also have a series of emails in place to continue to warm prospects. Provide future steps and engagement. Gating content isn’t an all or nothing activity. The key to your decision is to continually test whether your forms are yielding quality results and whether you’re able to use them. Don’t allow leads to wallow too long without communications. It dilutes their interest in your business. Have a series of useful content in place to automatically drip out to your new leads. Where possible include a question to get them engaged where your sales team can respond quickly. You can reveal some of your content to entice potential readers to want more. You can offer related content or gate the remainder of the content. Alternatively, you can provide other ways to capture prospects such as content upgrades. Tags Drift, Rand Fishkin, Starfleet Research. Bookmark the permalink. As for me it works 50/50. I mean it’s good if there is a golden mean between gated and ungated content. All people are different and that’s great to have various types of content for any taste.